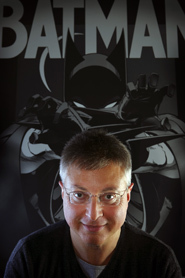 In this interview Michael Uslan talks about his early life and how it influenced him. As a young boy, he had a passion for comic books with a collection of about 35,000. Later in life he became the first college professor to teach a course on the history of the comic book at University of Indiana. It was also at UI he donated his collection of comic books. In this presentation he explains why he created his Batman movies and discusses his current project, a documentary, The Legends Behind Comic Books. Also check-out the book - Batman. Detective no. #27 by Michael Uslan in the Library catalog. Videos created and edited by local Las Vegas teens at the Las Vegas-Clark County Library District.